Thank you for joining us for the Totally Resistible Challenge and we hope you will all join us again this week too. As you know October is breast cancer awareness month. Apart from using some pink on our creations we all need to have a good feel of our breasts and if we notice anything unusual then we need to get them checked by a Doctor. If you are due for a Mammogram, make sure to make the appointment! This week we are showcasing Pink And Main Products You don’t have to use them for the challenge but if you have them we would love to see them used. I love the unicorns from the Magical Unicorns stamp set. 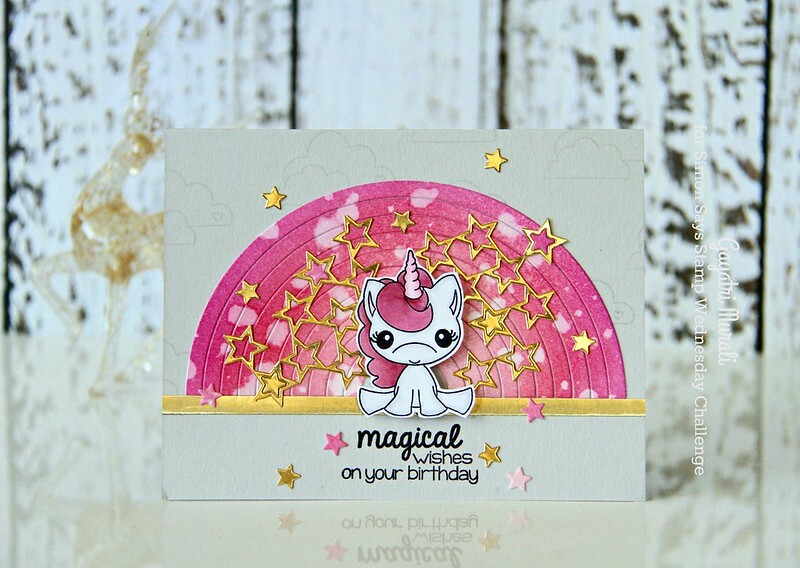 So cute that I used all the three unicorns from the stamp set to make a set of three cards for this challenge. 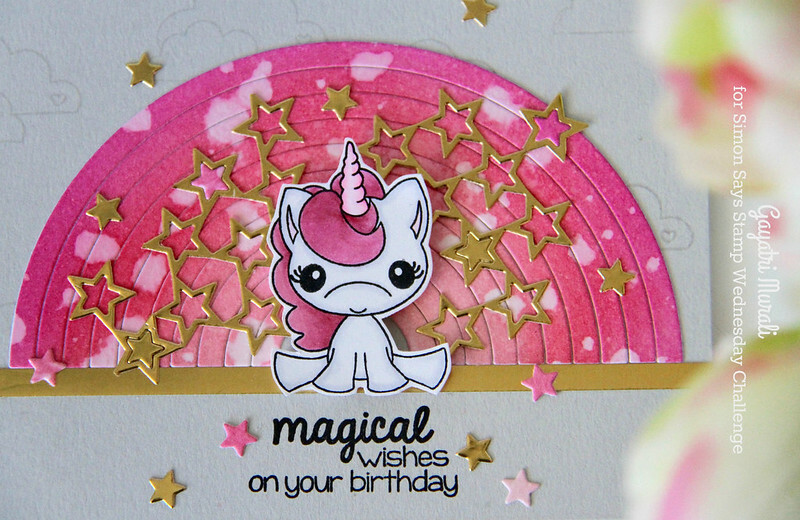 All three cards have unicorns, pink colour, fog card base and a splash of gold. I stamped all the unicorns, rainbow and clouds on white cardstock, coloured the rainbow and unicorns in pink, added grey shading to the clouds and hand cut them all out to make my cards. Here is the first one. As I said before my card base if made out of Fog card stock. I then sponged a watercolour paper with distress inks Spin Sugar, Worn Lipstick and Picked Raspberry randomly and spatter with water to add texture. I then used Simon Says Stamp Stacked Stars die to die cut the sponged watercolour paper. I adhered this die cut to the card front. At the centre of the die cut I adhered the Unicorn using foam adhesive. I tucked in the clouds and flush glued the rainbow. 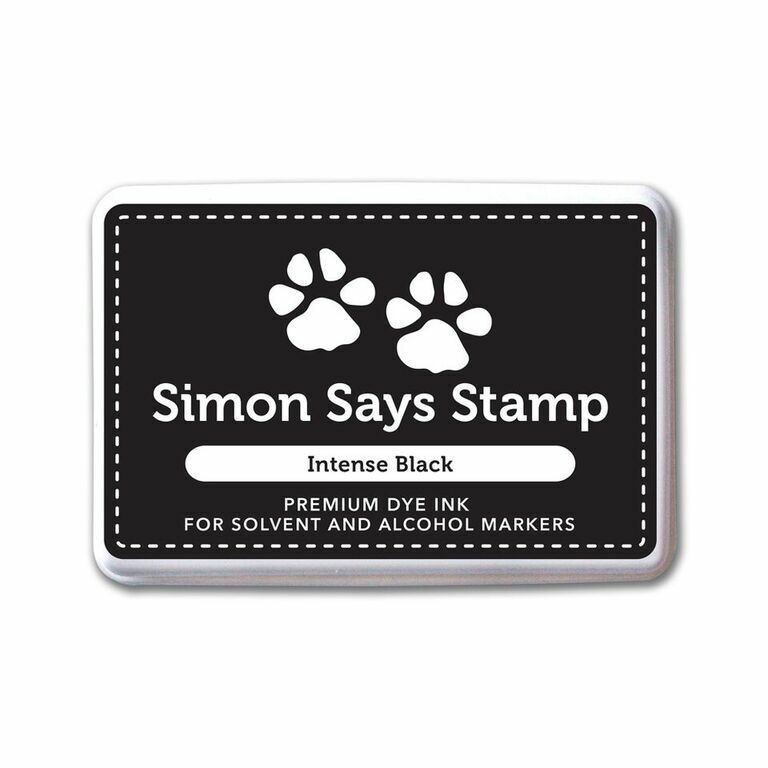 The sentiment I simply stamped on scrap piece of watercolour paper using Simon Says Stamp Intense Black Ink and adhered using foam adhesives. I die cut some scrap piece of gold foiled cardstock using the Stacked Star die and used the mini stars from the die cuts to scatter randomly on the card. 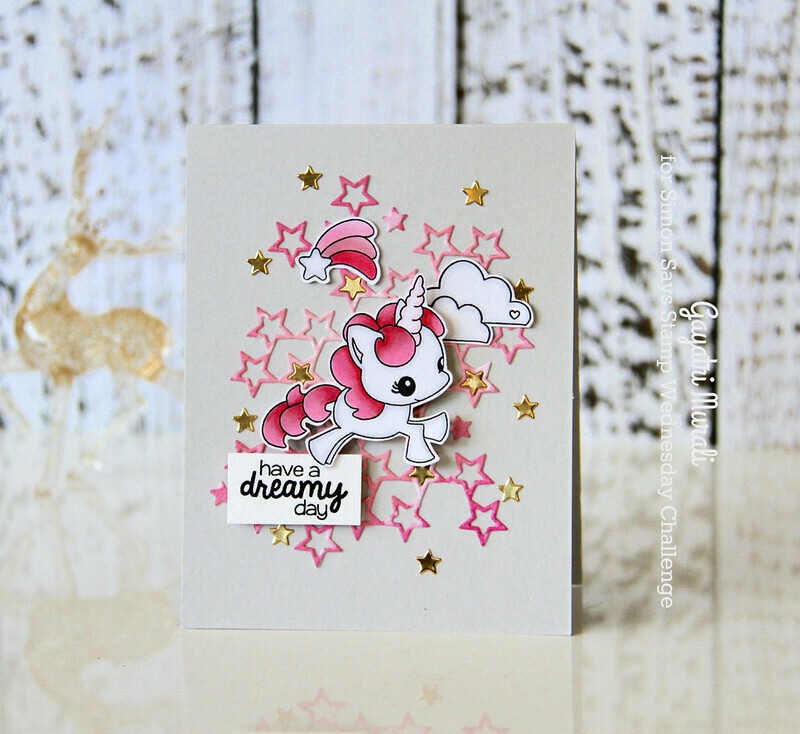 My second card uses another Unicorn from Magical Unicorn from Pink and Main and the Build a Rainbow die from Simon Says Stamp. On the card front I stamped the clouds randomly using Fog dye ink from Simon. One a watercolour paper I sponged distress inks Spun Sugar, Worn Liptstick and Picked Raspberry. I die cut rainbow using Simon Says Stamp Build a Rainbow die. To ground the rainbow(I know it sounds weird), I used a strip of gold foil paper. I used some Stacked Stars die cut using gold foil paper on the background and adhered the unicorn on the centre of the rainbow using foam adhesives. I stamped the sentiment using MISTI before I adhered the unicorn. Then scattered some of the gold and pink stars around the sentiment and focal image. 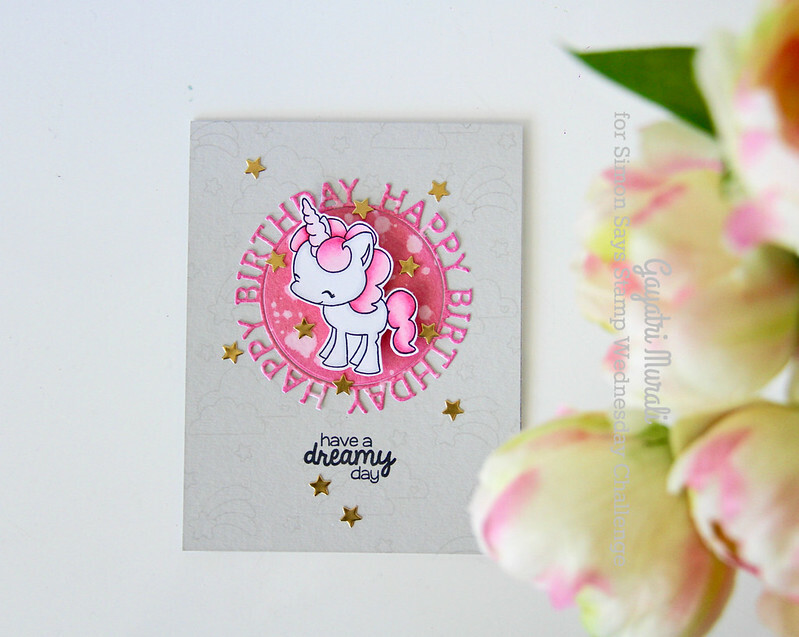 My third card uses the last Unicorn image from the stamp set and Simon Says Stamp Birthday Circle die. I stamped the card front with the clouds, rainbow and star images from the stamp set using fog dye ink from Simon. Again I sponged watercolour paper with the same distress inks and die cut the paper using Simon Says Stamp Birthday Circle die. I adhered this die with the centre circle on the top centre of the card front. I stamped the sentiment below the die cut and adhered the Unicorn on the centre of the circle die cut using foam adhesive. Finally I scattered glued some gold stars. Hope you like my set of cards. 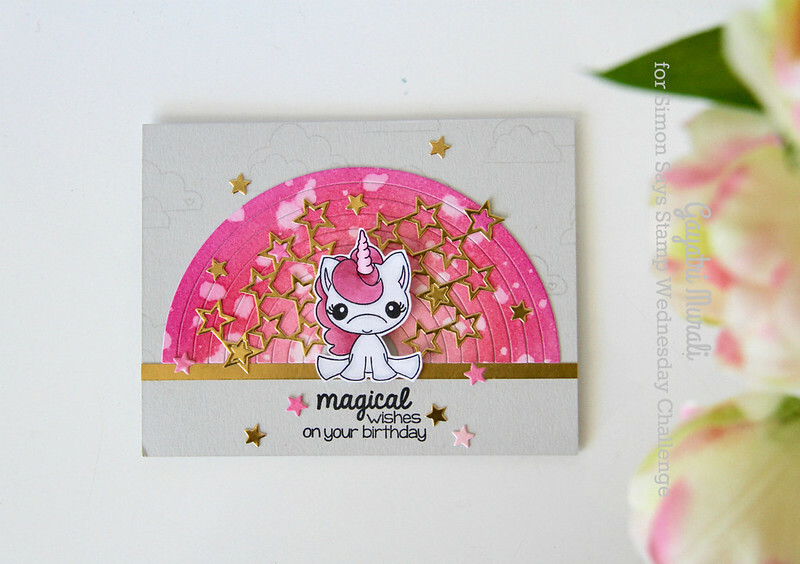 I really had fun with this Pink and Main Magical Unicorn stamp set and highlighting the challenge colour PINK! Thanks for stopping by my blog and have a lovely day! These are darling, Gayatri! I couldn't pick a favorite! I am wowed by your creativity, Gayatri! 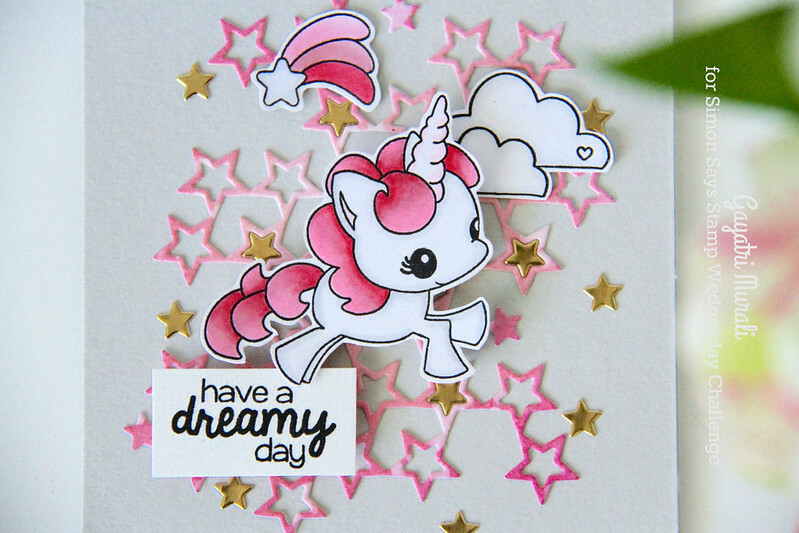 These unicorn card could not be any cuter and sweeter! Love! hi gayatri! these are all super cute cards, luv how you have used this set! have a great week! Darling cards Gayatri. 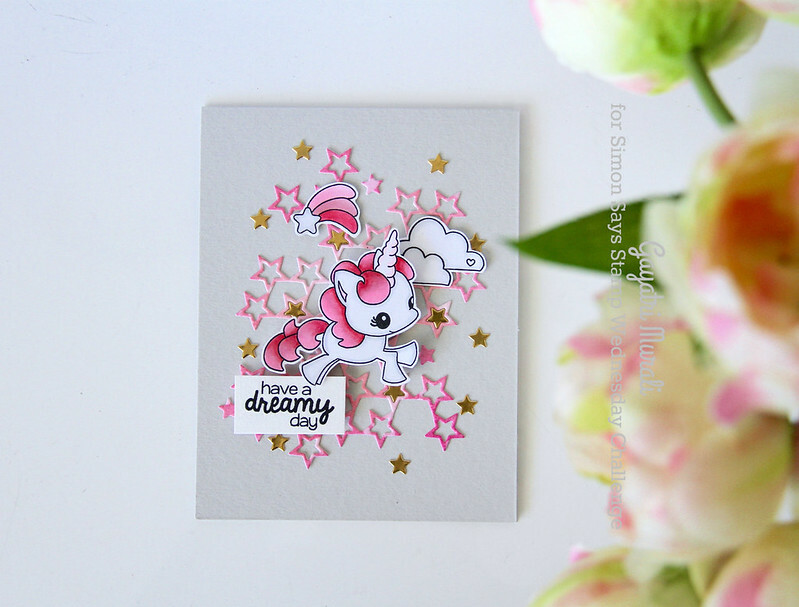 Love the sweet unicorn image… and all the pink! The touch of gold looks perfect. Great lay-outs and designs. These are SO cool Gayatri. Love that wee unicorn and the lovely backdrops you've given her! 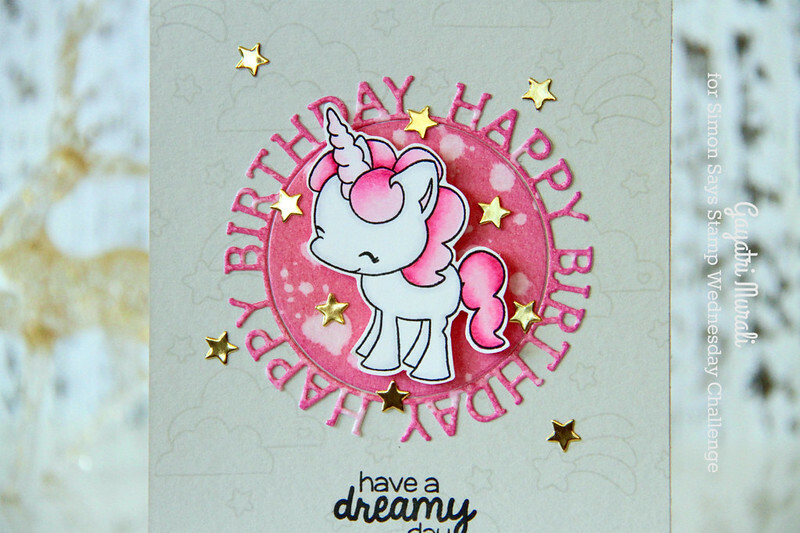 Gorgeous cards Gayatri, super designs and colours………I love the cute uninicorn is stuning with beautiful stars!!! Gorgeous card, colors and super designs!!! Super cute cards, Gayatri! Loving all the pinks!